A plane carrying 77 people, including a top Brazilian football team, has crashed on its approach to the city of Medellin in Colombia. 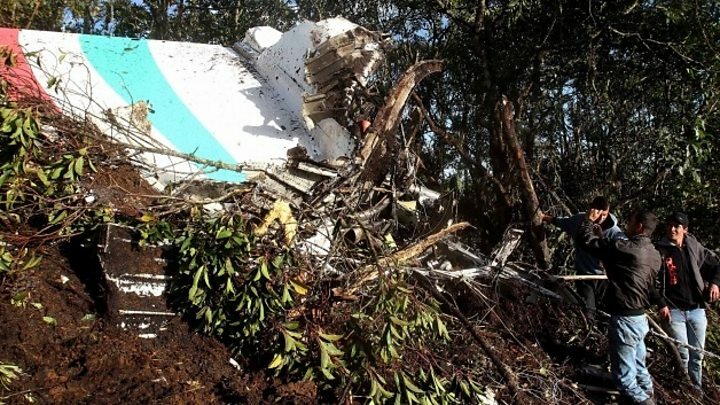 Colombia's civil aviation body says only six people survived the crash, blamed on an electrical fault. The team had been due to play in the final of the Copa Sudamericana, against Medellin team Atletico Nacional. 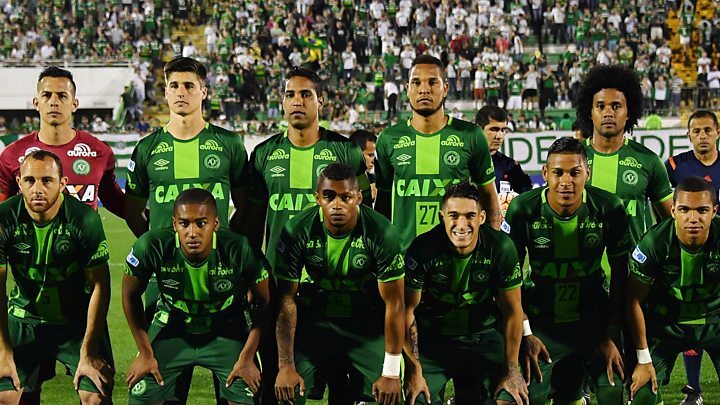 Organisers say Atletico Nacional has asked for Chapecoense to be awarded the cup. Brazilian clubs have offered to lend players to them for free for the next year. Colombian aviation officials said there were 21 journalists on board. 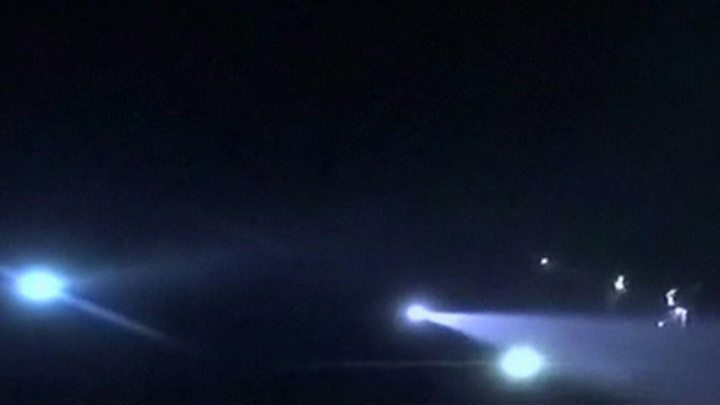 The plane lost contact with ground controllers as it approached Medellin at about 22:15 (03:45 GMT), after the pilot reported an electrical fault. It came down in a mountainous area. At least two of the survivors are footballers. They were confirmed to be defender Alan Ruschel and reserve goalkeeper Jackson Follman. Some reports suggest another defender, Helio Neto, was also rescued. Goalkeeper Marcos Padilha, also known as Danilo, was pulled alive from the wreckage but a spokesman said he later died in hospital. The sports network Telemundo Deportes tweeted (in Spanish) that Ruschel was in shock but conscious and talking, and had asked to keep his wedding ring and to see his family. Shortly before boarding in Sao Paulo, Chapecoense manager Cadu Gaucho, 36, appeared in a video posted on the team's Facebook site [in Portuguese] describing the trip to Medellin as "the club's most important to date". Playing in the final of the Copa Sudamericana was to be the highlight of a glorious season for the team from a small city of less than 200,000 inhabitants in the state of Santa Catarina. Founded in 1973, the team has been playing in Brazil's Serie A since only 2014 but is currently ninth ahead of much more famous and established teams such as Sao Paulo, Fluminense and Cruzeiro. Last week, it became the first Brazilian team in three years to make it to the final of the Copa Sudamericana, South America's second most important club competition, after beating Argentine side San Lorenzo. One of the founders of the club, Alvadir Pelisser, told BBC Brasil the tragedy had put an "end to everyone's dream". "We were a family, I'm shocked," he added. Brazilian President Michel Temer announced three days of national mourning, and top Spanish clubs Real Madrid and Barcelona held a minute's silence at the beginning of their practice sessions. Chapecoense's vice-president, Ivan Tozzo, told cable channel SporTV: "There are a lot of people crying in our city. We could never imagine this. Chapecoense is the biggest reason for joy here." Goalkeeping coach Marcelo De Quadros Kunst stayed in Brazil with players who did not travel to Colombia. He told the BBC: "We see wives fainting, ambulances taking them to the hospital, family members holding on to football boots left behind." Argentine forward Alejandro Martinuccio was one of those who had to stay behind. "I was saved because I got injured," he told Argentina's La Red radio. "I feel profound sadness. The only thing I can ask is prayers for the companions who were on the flight." Are you in the area? Did you witness the crash or the rescue? Let us know about your experiences. Email haveyoursay@bbc.co.uk with your stories.